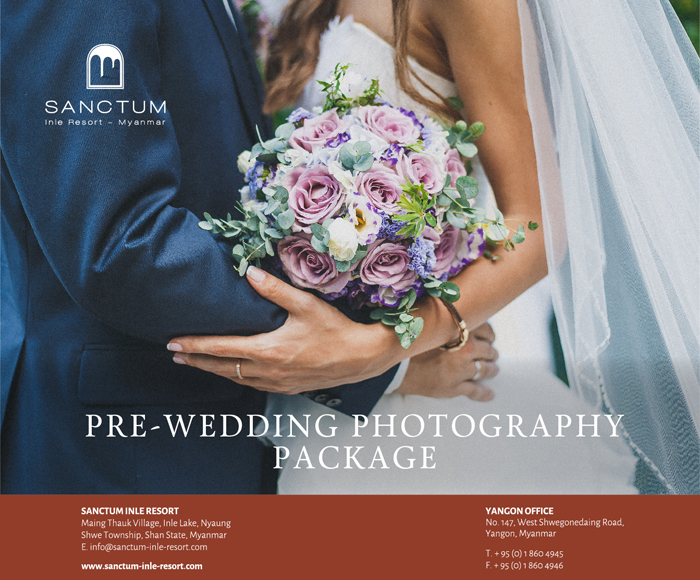 Create your ultimate wedding album with a full-day photo shoot amid dream settings ranging from our infinity pool to our luxurious venues to our stunning lawn at sunset. Above package is net which is inclusive of 5% Government Tax and 10% service charge. This package is offered subject to availability. To book contact dos@sanctum-inle-resort.com or reservation@sanctum-inle-resort.com. – Changing room will be used in your accommodation. - Maximum photography team of eight persons, including the bride and groom. - Packages are valid for weekdays only from Monday to Thursday. - Not applicable on weekends (Friday to Sunday), the eves of public holidays and during public holidays. - Ten days advance reservation is required. - Full prepayment is required upon booking confirmation. - Payment is non-refundable if canceled Ten days or less prior to arrival. - The hotel reserves the right to limit the areas in which the photo shoot can take place as per the requirements of hotel operations. - The photo shoot is not permitted at the Pool area after 10:00 am and it is recommended for the photographer to contact the hotel prior to the photo shoot to confirm the schedule.